When you visit Elmbrook Family Dental for a smile makeover consultation, Dr. Brunner, Dr. Taibl, Dr. Tack, or Dr. McGinn may recommend direct bonding or contouring. These minimally invasive procedures can improve the appearance of the teeth by removing or adding to their structure. 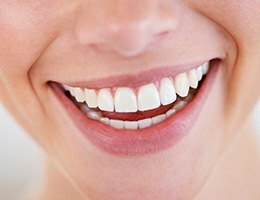 A quick and painless procedure, direct bonding restores the natural beauty of a smile by repairing chipped, cracked, or misaligned teeth with composite resin. Your cosmetic dentist may recommend direct bonding as a cost-effective alternative to porcelain veneers. Bonding does not last forever, but it will restore your smile's youthful attractiveness. The treatment strengthens natural teeth and produces a more vibrant smile in an hour or less. To soften the appearance of sharp teeth or to smooth rough teeth edges, Dr. Brunner, Dr. Taibl, Dr. Tack, or Dr. McGinn may also suggest cosmetic contouring. This process involves gently removing dental structure to create a more uniform and appealing smile. Our entire team looks forward to serving your family. Call our Brookfield, WI dental office at 262-444-0232 today to schedule an appointment. We’re open early mornings and evenings for your convenience. Located in Brookfield, our office also serves patients from Elm Grove, Milwaukee, Pewaukee, Waukesha, and New Berlin.